Consumers rights group wants 'deep expertise' as it changes £10m marketing mix. Which?, the consumer rights group, has appointed three independent agencies to handle its estimated £10m media planning and buying account. Craft Media London will look after communications strategy, Goodstuff Communications will handle brand planning and buying, and Brainlabs will add digital performance planning and buying to its existing search role. MC&C previously held the bulk of the Which? media business and did not take part in the review. Sarah Threadgould, who was previously group marketing director and recently took on an expanded role as chief customer officer, said: "We need to make sure that Which? is as relevant today as it has always been, and as we respond to this challenge our media planning and buying needs have evolved too. "We have selected a group of agencies that we believe will enable us to adapt our approach and maintain performance in crucial areas." Threadgould added that it made sense to use three agencies because "what we see in each of them is fantastic, deep expertise" in different areas. Which? is also changing its marketing mix as part of a broader focus on audience engagement. The not-for-profit organisation said in its half-year results earlier this month that subscription revenues have declined slightly, after it decided "to stop direct-response TV marketing during 2017/18 as it was no longer cost-effective". Threadgould explained: "We need to make the brand more visible and drive online efficiency." Which? 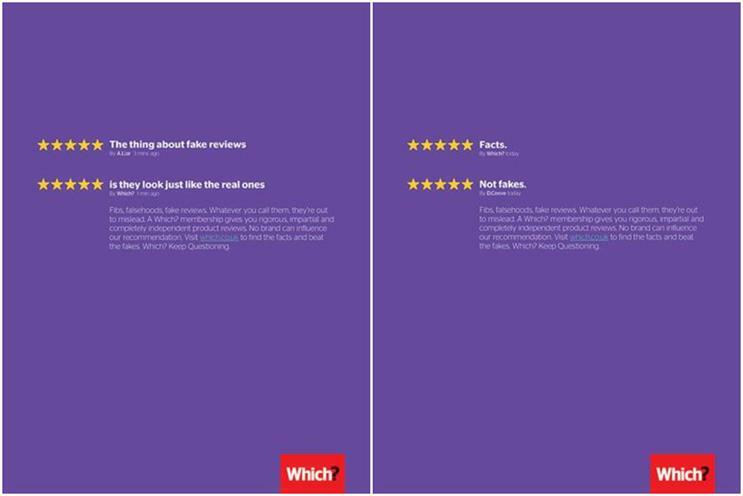 appointed Grey London as its creative agency in 2017 and its most recent campaign highlighted the problem of fake reviews. The consumer rights group, which was founded in 1957, has 1.35 million members and supporters, and turnover of £100m. Jen Smith, co-founder of Craft Media London, said: "In a world full of fake news and reviews the work that Which? does on behalf of consumers is vital. We are delighted to be working with them to help shake the market up." Andrew Stephens, a founding partner in Goodstuff Communications, said: "It feels like now is the moment for Which? to assert itself as a consumer champion and we can’t wait to get started." Craft Media London is already close to Goodstuff Communications as they have had an informal alliance since 2017 and it also worked with Grey London on the fake reviews campaign.